WOW (Wind On the Way!!)! 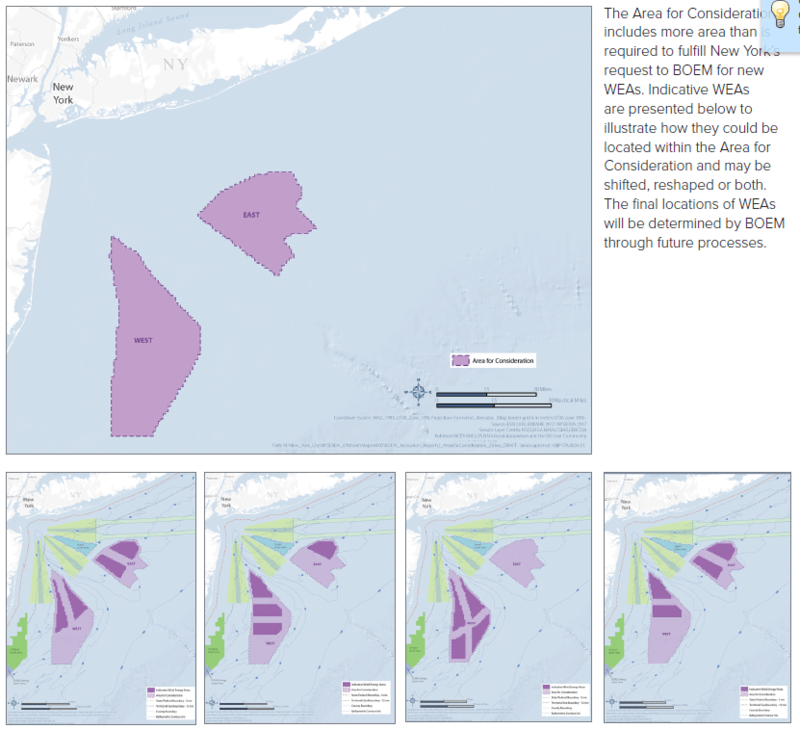 On October 2, 2017, New York State stepped up with more new potential off shore wind areas! You can find out more information from New York State Energy Research and Development Authority (NYSERDA) here. No one could say these aren’t interesting times. We’re just glad you’re here with us for them!! Thank you for your help and support! The New York State Energy and Research Development Authority (NYSERDA) is leading the development of offshore wind on behalf of the state. 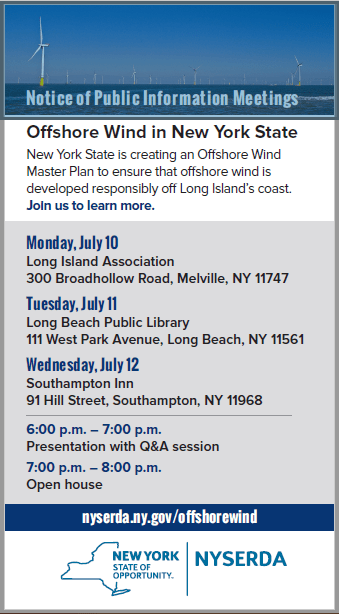 Throughout 2017, NYSERDA is conducting extensive stakeholder outreach and directing over twenty studies and surveys to ensure that offshore wind is developed responsibly. This work will culminate in the New York Offshore Wind Master Plan, to be released by the end of 2017. We hope you all can make at least one of these meetings. The question posed by an audience member who, like for others nationwide, the little lightbulb has gone off as they start to understand why we have so little renewable energy. 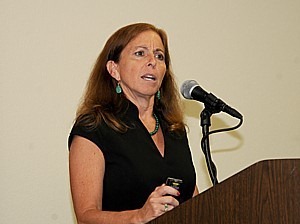 Today the Long Island Association (LIA) hosted Long Island’s first Offshore Wind Conference. Hundreds of legislators, business leaders, environmentalists, renewable energy advocates and concerned citizens were on hand as Long Islanders took the next step towards entering the offshore wind era. He said we are continuously “faced with a false choice: allowing current levels of pollution versus disrupting business”. Next Catherine Bowes From National Wildlife Federation spoke about her group’s pressing need to get the word out that “climate change is the single greatest threat to wildlife”… and thus they are “100% committed to large-scale Renewable Energy projects” like the offshore wind proposals being talked about. Adrienne Esposito, the outspoken voice of Citizen’s Campaign for the Environment gave a lively and informative presentation. “LIPA is making decisions now how they will generate the next 2000 Megawatts they need, what will we choose? We need to choose generation with the least impact: wind”. It was too small thus too expensive –> needs economy of scale. It was too close, thus too controversial –> eliminate the visual impact. He explained that LIPA had unused land and proposed using that land for large turbine manufacturing, creating both an economical and convenient launch for any offshore wind farm… with further economical development potential as a manufacturing base for other farms. Bill Moore; “Wind energy can actually REDUCE ALL OTHER energy generation costs by 2.5 cents / kWh” and “Sea Breeze: Peak output coincides with peak demand”. Carol Murphy; “8000 mw of renewable energy can be added without affecting grid reliability” and “every 1000 MW of Wind saves $300 million in worldwide energy costs. He did add, when asked if money was to blame for the seemingly incongruent and completely hypocritical stances of the opposition, that “so far, for this year’s presidential election, 25% of all of the donated money has come from just 16 people”. In positive news, to free up money to further renewables, he said we should look at lifting the cap on private activity bonds. He said NYSERDA “can provide good reseacrch investments to indentify projects with benefits reaching beyond our local area”. We welcome the beginning of the Offshore Wind Era to Long Island. Cuomo proposed competitive bidding to attract large-scale solar projects. … NYSERDA, has set out a plan to realise Cuomo’s goal, which the authority says could bring 269 MW of solar to the state from 2012-2015, and 110 MW some time after. 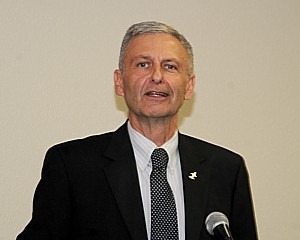 NYSERDA calls the plan ‘aggressive but achievable’. …solar renewable energy credits (SRECs), or other methods to move the industry beyond developing hundreds of megawatts of solar into thousands of megawatts. Cuomo also is opening up new opportunity for big solar projects through his new ‘Energy Highway’ initiative to upgrade the state’s aging infrastructure. As part of the (‘Energy Highway’ ) initiative, his office issued a formal solicitation in April 2012 seeking ideas … to fix various energy problems…. so that it reaches its target of getting 30% of its electricity from renewable energy by 2015 and more beyond that. The state hopes to draw $2 billion in private investment. The article goes on to mention our local utility LIPA’s involvement, achievement and proactive stance in delivering utility scale solar at minimal cost to ratepayers. Sell their rooftop solar into the grid at a realistically profitable price (similar to what they pay the big corporations). Have access to participate in off-property “virtual metering”, “community” or “cooperative” projects (like community wind in Minnesota) where individuals can invest their money to generate any viable renewable energy (wind and eventually ocean/wave as well) and sell it to and through the grid. Millions of apartment dwellers can never be investors, and are relegated to be just “consumers”, never providers. That’s not to say individuals shouldn’t do what they can with solar on their roof, but if we need more, why not pay New Yorkers for it and allow more? News flash: it is not a free market out there. These types of projects are near impossible to do because current tax code and utility laws are set up to keep the already picked winners in their monopolized place at the top, and keep what I’d like to call “democratic energy” from expelling them from that position. No: you cannot invest in renewable energy except through megacorporation stocks or a small generator on your property that only offsets your use. This is the number one thing keeping renewable energy and the “green economy” in it’s so-called place. It is going to take a “green revolution” to get there. Governor Cuomo it’s a start, but a half one at best. Why are we soliciting mega corporations, with development money that guarantees no results, This, when the average New Yorker, who would love to, cannot invest in renewable energy other than offsetting only their own household use and only on their own home, or by buying stock in, say BP, as one of the few mega companies with a dedicated solar division? That doesn’t allow New Yorkers, to do more! That’s the question that defines All Our Energy’s entire existence. Would you like to invest in renewable energy? Let’s find out how to do that and get things done differently, together!